2137 Union Hill Road in Malvern, up for auction on July 31, 2017. As much as real-estate market conditions in the greater Philadelphia area have improved in the past few years from the doldrums of 2008-2014, there still are some true buying opportunities lurking. For example, on July 31, 2017, Concierge Auctions will offer for sale an 18+ acre estate in Malvern, Pa., on the western edge of Philadelphia’s Main Line. Previously listed at $2.15 million, it will sell without reserve — that’s right, a minimum selling price has not been set. Preview the home on July 18th between 1:00 and 3:00 and enjoy a light lunch, or stop in daily between 1:00 and 4:00 or schedule an appointment. Located at 2137 Union Hill Road in Malvern, this is a beautifully built home — brick construction, mahogany floors, hand-carved mahogany doors, high ceilings and generous use of French doors and tall windows for fantastic views and natural light — and quality is evident from top to bottom. A party-sized terrace stands ready to host large gatherings. The kitchen is outfitted with Sub-Zero and Wolf appliances. There are six bedrooms, and 6.4 baths. A first-floor suite is perfect for an au pair or long-term guest. The property has a new generator, built-in central vacuum and is wired throughout for cable/Internet. 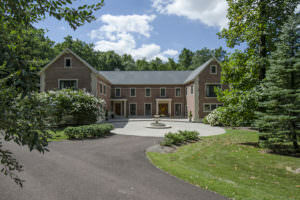 This home’s Malvern setting is serene and a sought-after part of Philadelphia’s Main Line. Known for its concentration of estate homes, this area is just five miles from the Malvern SEPTA rail station for easy access to Philadelphia and is only 30 miles from Philadelphia International Airport. Pickering Valley Golf Club is less than five minutes by car. Top-notch equestrian facilities are nearby, as are many highly regarded schools. For more information, or to schedule a private tour of the property, please contact Christian French of Concierge Auctions. Cell: 646.436.8723. Christian.French@conciergeauctions.com. See more about the auction here.